Understanding Apache Hive 3 major design changes, such as default ACID transaction processing and support for only the thin hive client, can help you use new features to address the growing needs of enterprise data warehouse systems. YARN allocates resources for applications across the cluster and enables authorization for Hive jobs in YARN queues. Hive updates the data in HDFS or the Hive warehouse, depending on the table type. Hive returns query results over a JDBC connection. If a legacy script or application specifies MapReduce for execution, an exception occurs. You can set an option to silently ignore a MapReduce setting. Most user-defined functions (UDFs) require no change to execute on Tez instead of MapReduce. Tightly controlled file system and computer memory resources, replacing flexible boundaries: Definitive boundaries increase predictability. Greater file system control improves security. By default, the HDP 3.0 Ambari installation adds Apache Ranger security services. The major authorization model in Hive is Ranger. 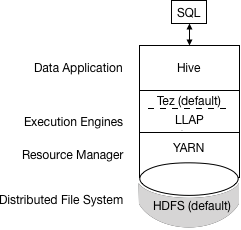 This model permits only Hive to access HDFS. Hive enforces access controls specified in Ranger. This model offers stronger security than other security schemes and more flexibility in managing policies. If you do not enable the Ranger security service, or other security, by default Hive uses storage-based authorization (SBA) based on user impersonation. ACID tables are the default table type in HDP 3.0. ACID enabled by default causes no performance or operational overload. You do not need to bucket ACID tables in HDP 3.0, so maintenance is easier. Hive 3 supports only the thin client Beeline for running queries and Hive administrative commands from the command line. 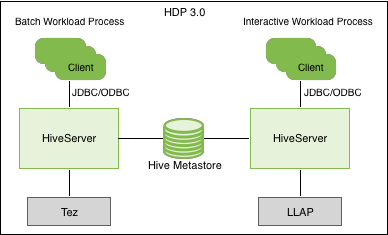 Beeline uses a JDBC connection to HiveServer to execute all commands. Parsing, compiling, and executing operations occur in HiveServer. Beeline supports the same command-line options as the Hive CLI with one exception: Hive Metastore configuration changes. Instead of maintaining the entire Hive code base, you now maintain only the JDBC client. Startup overhead is lower using Beeline because the entire Hive code base is not involved. Session state, internal data structures, passwords, and so on reside on the client instead of the server. The small number of daemons required to execute queries simplifies monitoring and debugging. HiveServer enforces whitelist and blacklist settings that you can change using SET commands. Using the blacklist, you can restrict memory configuration to prevent HiveServer instability. You can configure multiple HiveServer instances with different whitelists and blacklists to establish different levels of stability. The change in Hive client requires you to use the grunt command line to work with Apache Pig. HiveServer now uses a remote instead of an embedded metastore; consequently, Ambari no longer starts the metastore using hive.metastore.uris=' '. You no longer set key=value commands on the command line to configure Hive Metastore. You configure properties in hive-site.xml. The Hive catalog resides in Hive Metastore, which is RDBMS-based as it was in earlier releases. Using this architecture, Hive can take advantage of RDBMS resources in a cloud deployments. Spark and Hive now use independent catalogs for accessing SparkSQL or Hive tables on the same or different platforms. A table created by Spark resides in the Spark catalog. A table created by Hive resides in the Hive catalog. Although independent, these tables interoperate. You can access ACID and external tables from Spark using the HiveWarehouseConnector. You can connect to Hive using a JDBC command-line tool, such as Beeline, or using an JDBC/ODBC driver with a BI tool, such as Tableau. Clients communicate with an instance of the same HiveServer version. You configure the settings file for each instance to perform either batch or interactive processing.